Juried shows are what you make of them, whether you’re an artist, the sponsoring venue or the juror. They can provide a chance to reach a new audience, expand your portfolio, or find out which artists you’ve not previously been aware of who are making work that deserves your attention — and possibly a place in your collection. 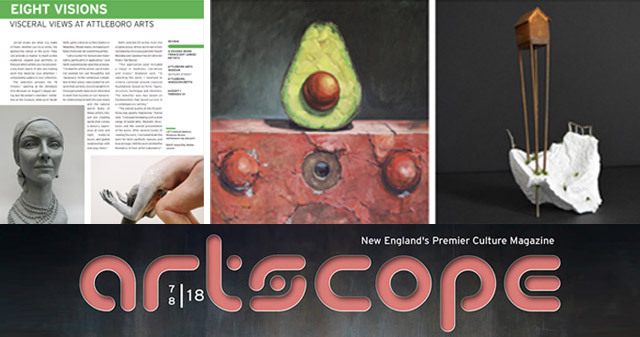 The selection process for “8 Visions,” opening at the Attleboro Arts Museum on August 1, began during last December’s members’ exhibition at the museum, when juror Sarah Swift, gallery director at Hera Gallery in Wakefield, Rhode Island, reviewed portfolios from over 60 submitting artists. Swift selected 20 artists from the original group, whose works were then reviewed by Artscope publisher Kaveh Mojtabai and Galatea Fine Art director Hilary Tait Norod. The final eight represented a cross section of New England artists: Deborah Baldizar (ceramics, Seekonk, Massachusetts), Fehmida Chipty (photography, Winchester, Massachusetts), Allison Elia (sculpture, Providence, Rhode Island), Stephen Fisher (still life drawings, Warren, Rhode Island), Tatiana Flis (drawings and sculpture, Millbury, Massachusetts), Joan Hausrath (monoprints, Pawtucket, Rhode Island), Brian McClear (contemporary representational paintings, West Hartford, Connecticut) and Lorraine Sullivan (found object art, Arlington, Massachusetts). Fisher noted that the commonality to all his still-life drawings is an obsession with intense perceptual rigor, compositional manipulation, the viscosity of light and the tactile, sensual nature of drawing materials. “[My] objects are generally chosen and assembled with their allusive characteristics in mind, responding to the inherent multiplicity of associations that may be evoked by those objects. [The] combinations of objects are intended to elicit interactive associations as the allusions of one object overlap those of another,” he said. If the images of her work on her Instagram page this past spring are any indication, Baldizar’s sculptures will be stunning to see in a museum setting. The show’s announcement notes that her ceramic figures “grow out of a desire to visually translate the psychological concept of the shadow, or parts of one’s identity concealed from others, either consciously or unconsciously. She is interested in the effects of human attempts to suppress, deny or neglect the true self.” Indeed, looking at them, you can feel her hand shaping the expressions of her subject’s faces with close attention to the markings that detail each life experience. McClear, a representational painter with a passion for the interplay between form and texture and how things fit together, works primarily in oil, with the goal of presenting a balance and solidity that invites interpretation. Swift said she was pleased with the 8 visionaries, many of whom were favorites of hers during the initial selection process. “I love that there is an underlying theme of texture and material, all presented in different media,” she stated.